My show with director Mark Kennedy-McClellan, at Caveat New York, was a hit – it was featured in the New York Times and got a lovely writeup on the Dana Foundation Blog! This is the second performance of this show, which is part of a series called Talks Progress Administration, in which a scientist is paired with a theatre director to create an engaging public talk. Mine is on episodic memory and this is the second version – the first one included music and storytelling and this one was a “whodunnit” style mystery about stolen memories. Who knows what the next one will look like?! This entry was posted in Uncategorized on March 19, 2018 by pcroxson. It’s nearly my favourite week: Brain Awareness Week! Tuesday, March 13: My science talk/theater project, The Time Traveling Brain, with director Mark Kennedy-McClellan is back at Caveat as part of their Talks Progress Administration series. Come and hear me take a journey through our memories and investigate how they allow us to travel in time. Friday, March 16: I’ll be appearing in Monotony! a comedy show where people make boring stuff sound interesting. This entry was posted in Uncategorized on February 26, 2018 by pcroxson. On March 5 The Story Collider hosts a show featuring five true, personal stories of chasing destiny in science from Hossein Aleyasin, Peter Brannen, Anita Flores, Aletha Maybank and Rae Wynn-Grant. Hosted by me and Erin Barker. Get advance tickets here! This entry was posted in Uncategorized and tagged Storytelling, The Story Collider on February 3, 2018 by pcroxson. November, 2017 – I was thrilled to be chosen as the recipient of the Society for Neuroscience Science Educator award for my work in educating the public about science. Check out the press release here. Special thanks to the Dana Foundation for sponsoring the award. They wrote about it here. I’m excited to keep doing this work in the upcoming year. This entry was posted in Uncategorized on February 3, 2018 by pcroxson. I’m thrilled to be taking on a new role as New York Producer for The Story Collider! As well as being really excited about science, I’m also passionate about storytelling, so I’m really happy to be more involved with their efforts. We’re always looking for storytellers, so if you have an idea, pitch it to us here. And don’t forget to check out our podcast for past stories. This entry was posted in Uncategorized on August 25, 2017 by pcroxson. Mark Baxter and I are searching for an RA to work on this really exciting project involving chemogenetic manipulation of the basal forebrain and working memory. A full-time position is available for a Research Associate I in the laboratories of Paula Croxson and Mark Baxter. The laboratories work on the cognitive neuroscience of memory and higher cognitive function. The applicant will be required to perform and assist with research using behavioral testing, MRI scanning, surgery, histology and epigenetic techniques. S/he will manage the day-to-day running of the lab. S/he will also be involved in coding new behavioral tasks, carrying out literature searches, analyzing data and creating manuscript sections, figures and presentations. Interested candidates should have an undergraduate degree in Neuroscience, Biological Science or a related discipline. Must also have excellent verbal and written English. Research experience is preferable and experience with behavioral testing of laboratory animals is desirable. Candidates with programming experience (particularly Matlab) or experience with MRI analysis packages (FSL, SPM , Freesurfer, AFNI) are also encouraged. This entry was posted in Uncategorized on June 9, 2017 by pcroxson. 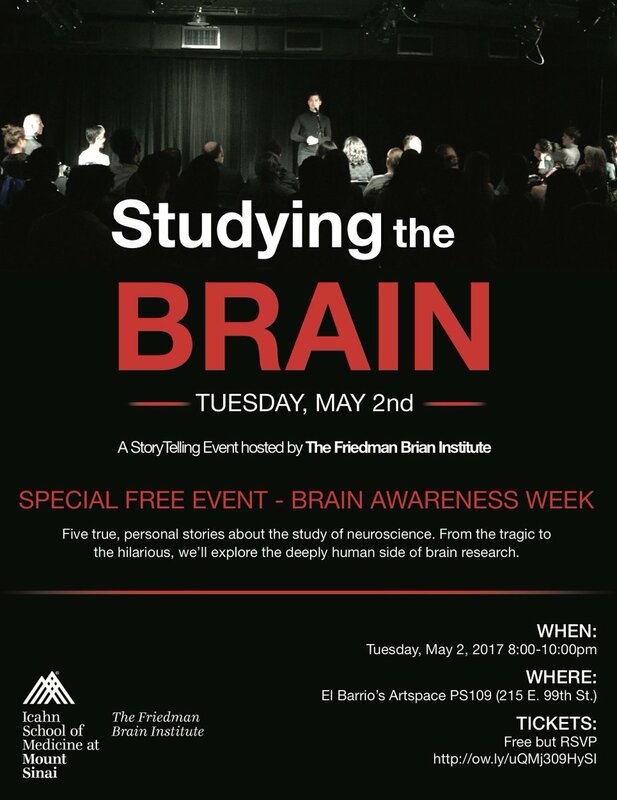 After we had to cancel it for bad weather, we got to reschedule our storytelling show, “Studying the Brain” for May 2, 8pm, at El Barrio’s Artspace. It’s going to be amazing! Tickets are free: book now. This entry was posted in Uncategorized on April 25, 2017 by pcroxson.